Many politicians make an excuse that they must be rich or holding a position of power before they can help others to have a better life. I believe it is just an excuse to cheat people of their votes. Once they get what they want i.e. rich and holding a position of power, their standard answer after showing an effort to help their constituents is, “that is all I can do”. If a person who aspires to be a politician is sincere, and their true desire is to help others, then there is no need for wealth or position of power to start helping. Assistance comes in many forms, tangible or intangible, big or small. For a person in need any form of assistance is appreciated. However, we must never take those in dire straits for granted for they have “the power of the pen”. They voted you in. They can also vote you out!! So, my issue is with the Deputy President of PBS – Huguan Siou hopeful, a (Federal) Minister of Science, Technology and Innovation and a Doctorate to boot – Maximus can do better than “I am doing my part” cliché. The case of Puan Rosina @Annie Maramal of Kota Marudu is not just about one family or about one dilapidated house. It is about the duties and responsibilities of a person GIVEN the mandate by the people from Kota Marudu, not just to look after their welfare but also the whole of Malaysia specifically Sabah. In this instance, I feel Maximus is not suitable to be a minister because he lacks the sincerity and empathy for the people to carry on the job at Putrajaya. everyone or anyone who is listening. For her to be in the opposition is not the point. She is just showing to the people, the very shallow understanding of a Minister from Putrajaya about the plight of the poor in Sabah. 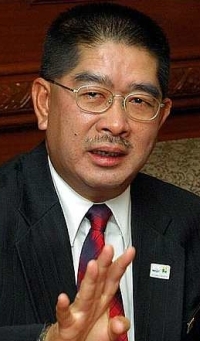 The sad truth is the Minister himself was elected from the Kota Marudu Constituency. To throw a challenge to Christina Liew to build 1,800 units of houses is pathetic to the core. To be honest I have a better suggestion to the present minister. How about giving your job in Putrajaya to Christina Liew? Perhaps she may even build more than 1,800 units of houses in Kota Marudu and to top it up she may have completed it YESTERDAY. Is Maximus man enough to admit this and give way to a more capable person? Obviously, and sadly a Sabahan, a Kota Marudu member of Parliament and a Minister in Putrajaya, I have to say he has failed in his duties and responsibilities. government has no desire to arrest. Maximus, I wonder if the people in Kota Marudu will give you another chance to be their representative or are you that thick to insult their intelligence by asking them to vote for you again?! Presently the elected representatives from Sabah who have the golden opportunity to be in Putrajaya obviously do not talk to each other. Instead of banding together for the sake of Sabah they tend to go on their merry path. Siok sendiri!! It is a known fact that Sabah has the most resources and yet why are we so poor? Please tell me. If Sabahans are to say there is nothing wrong here, then I say we deserve what we get. the self-maximus-centred politikus is only glorifying, enriching himself and enjoying the fruit of his public post.